But gold prices soared $16.40, or 1.5%, to $1,119 per troy ounce on Wednesday. Wednesday's close marked gold's highest finish since Sept. 8. Stoking yesterday's gold rally were signs the Fed may not tighten its easy monetary measures until later this year. 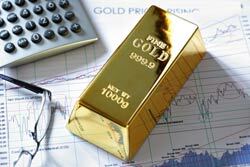 A softer dollar and declining inflation also helped lift gold prices Wednesday. Both supported an increasing consensus among economists that the U.S. Federal Reserve will hold off raising interest rates for another month or more. Labor Department data released Wednesday showed U.S. inflation fell 0.1% in August month over month. That was the first inflation drop since January. That trend sends mixed signals to the Fed, which has been looking at improving U.S. economy and jobs figures. Fed officials have been concerned that consumer price increases have run below their target rate of 2% in recent months. Raising rates could elevate the risk of deflation.